"I do not think we would like to be called backward here, do you, Miss Jenkyns?" The novels and stories of Elizabeth Gaskell don't have quite the cachet of the works of Jane Austen or the Brontes, but once that limited ouevre has been mined, the insatiable desire for provincial English village material made her a natural target. This BBC miniseries, in association with WGBH, assembles three of Gaskell's novellas into a delightful picture of early Victorian Cheshire, with plenty of character and signature English oddity and classism. In the village of Cranford in 1842 and 1843, time has stood still for quite a while, thanks to the ruling class of spinster ladies who determine propriety with an iron fist. At the apex are the Jenkyns sisters, Matty (Judi Dench) and Deborah (Eileen Atkins), who share gossip with busybodies Mrs. Forester (Julie McKenzie) and Miss Pole (Imelda Staunton), peering down their noses at the working classes and delighting in every picayune detail of village life from the death of the parish bull to a lace-eating cat to suspicions of a crime wave overtaking Cranford. Matters are upset to some extent as young Mary Smith (Lisa Dillon) comes to stay with the Jenkyns sisters, and even more so when a new young doctor, Frank Harrison (Simon Woods) sets up practice with new and unusual methods. But perhaps the most shocking development is the impending intrusion of the outside world as the railroad threatens to come to Cranford and destroy everything that the ladies hold dear. The ample running time allows for plenty of development of the multitude of characters, with several getting a focus in each of the five one-hour episodes. While the village is like small towns everywhere in its love of gossip and making much of triviality, there is also a close bond among the residents of Cranford that on occasion even stems beyond class. That's seen most clearly in the interest that solicitor Edmund Carter (Philip Glenister) takes it upon himself to educate a young boy, Harry (Alex Etel of The Water Horse), whose parents consider him likely to be spoiled by such learning. That's a persistent theme in the series and one of the most blatant expressions of class grudges, as the working class knows its place and upper crust Lady Ludlow (Francesca Annis) sees educating them as leaving them fit only for (sneer) trades. The evolution of life with the Industrial Revolution only tangentially hits Cranford, but it's not immune and change inspires fear and suspicion. One of the more amusing threads of the last half of the series is the clueless Dr. Harrison finding himself getting romantically entangled with several women, without even being aware that he's doing so. The know-it-all ladies consult their texts and treatises on the meaning of various flowers and gifts, and conjure up tales of love and commitment where nothing is intended beyond a polite kindness. The persistence of the ruling ladies, and the father of at least one of the ladies involved, however, are such that Dr. Harrison quickly finds himself in complete disrepute and in danger of being forced out of the village, even after he has proven himself a more than capable physician. Lisa Dillon does a fine job of serving as Mary Smith, the glue for the series, the outside observer who quietly makes note of the idiosyncrasies of Cranford and a solid representative for the viewer (if not Mrs. Gaskell herself). Dench is marvelous as always, especially in the last episode as she faces possible lonely pauperdom with a stiff upper lip. Michael Gambon is every bit her equal as Thomas Holbrook, who was rejected as a suitor by Matty thirty years earlier, but who is determined to make her his at last. The series might become tiresome if it were entirely given over to the obsessions of the spinster aristocrats, but happily there's plenty of wit and local flavor offered to give one a delightful picture of a pastoral. While there are threads of a plot, Cranford is content to present a place, warts and all, with engaging thoroughness. The characters grow and develop in credible ways, and when they cannot they invariably find the consequences fatal. Even the isolated village cannot inoculate itself from change. The final episode ties up matters a bit hastily with a multitude of marriages, but otherwise the series is quite satisfactory, often poignant and moving and occasionally humorous. Image Transfer Review: The anamorphic widescreen image looks quite nice overall. Shot on digital video, the program offers plenty of detail and reasonably good texture, although some sequences are a bit soft (apparently by intent). The palette is quite drab, with very little color (which would have been highly improper in Cranford village life). There's no evident artifacting or other problems, making this quite a satisfactory viewing experience, especially in the sequences lit only by candle, which offer a nice warm glow. Audio Transfer Review: The 2.0 audio is solid, with clear dialogue throughout and no signs of hiss or noise. There isn't much directionality except for a few occasions, which come as a bit startling. Extras Review: The sole significant extra is the interesting documentary The Making of Cranford (29m:48s). This tends to focus on the liberties taken in adapting Gaskell's work, as well as the often surprisingly modern dialogue that she wrote. There's also attention given to the elaborate costume work that makes the atmosphere of Cranford so credible (though clothing seems unaccountably clean throughout). Handy "play all" buttons are included for long-term immersion in Cheshire. 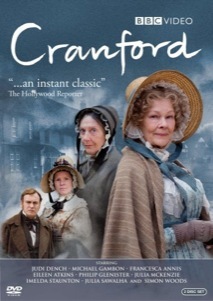 A delightful examination of English village life in the early Victorian period, Cranford is replete with terrific performances and oodles of period detail. The transfer is attractive if suitably drab.